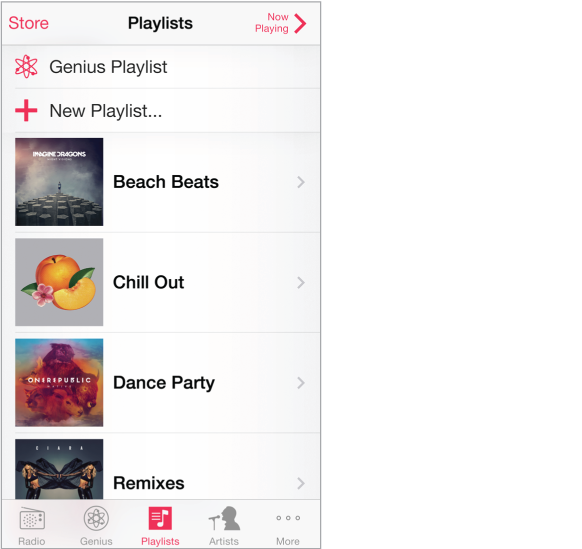 Create playlists to organize your music. View Playlists, tap New Playlist near the top of the list, then enter a title. Tap to add songs or videos. Edit a playlist. Select the playlist, then tap Edit. Add more songs: Tap . Delete a song: Tap , then tap Remove. Deleting a song from a playlist doesn’t delete it from iPhone. Change the song order: Drag . New and changed playlists are copied to your iTunes library the next time you sync iPhone with your computer, or through iCloud if you’ve subscribed to iTunes Match. Clear or delete a playlist you created on iPhone. Select the playlist, then tap Clear or Delete. Remove a song from iPhone. Tap Songs, swipe the song, then tap Delete. The song is deleted from iPhone, but not from your iTunes library on your Mac or PC, or from iCloud.